The Branch Rickey Award is given annually to an individual in Major League Baseball (MLB) in recognition of his exceptional community service. 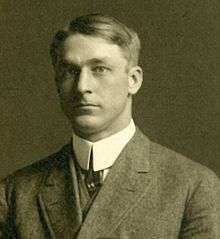 The award is named in honor of former player and executive Branch Rickey, who broke the major league color barrier by signing Jackie Robinson, while president and general manager of the Brooklyn Dodgers. Rickey also created the Knothole Gang, a charity that allowed children to attend MLB games. 1 2 3 4 "Roland Hemond to receive 2003 Branch Rickey Award" (Press release). Major League Baseball Advanced Media. November 7, 2003. Retrieved August 13, 2012. 1 2 3 4 "Trevor Hoffman selected as 2008 Branch Rickey Award recipient" (Press release). Major League Baseball Advanced Media. October 2, 2008. Retrieved August 13, 2012. ↑ "Winfield first Rickey Award recipient". Ludington Daily News. Associated Press. October 29, 1992. p. 14. Retrieved August 13, 2012. 1 2 Saunders, Patrick (September 13, 2012). "Mets ace knuckleballer R.A. Dickey wins Branch Rickey Award". The Denver Post. Retrieved September 17, 2012. 1 2 3 4 Street, Jim (November 2, 2004). 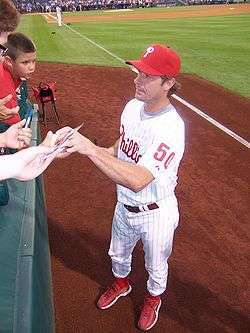 "Moyer wins Branch Rickey Award". MLB.com. Retrieved August 13, 2012. 1 2 "Smoltz wins Branch Rickey Award". ESPN.com. September 25, 2007. Retrieved August 13, 2012. 1 2 Stapleton, Arnie (October 9, 2009). "Angels' Torii Hunter wins Branch Rickey Award". Reading Eagle. Associated Press. Retrieved August 13, 2012. 1 2 "Vernon Wells wins 2010 Branch Rickey Award for working with kids". ESPN.com. September 16, 2010. Retrieved August 13, 2012. 1 2 "Shane Victorino of Philadelphia Phillies wins Branch Rickey Award for work with kids". ESPN.com. September 15, 2011. Retrieved August 13, 2012. 1 2 3 Singer, Tom (November 14, 2002). "Valentine recipient of Rickey Award". MLB.com. Major League Baseball Advanced Media. Retrieved August 13, 2012. 1 2 Harding, Thomas (November 12, 2005). "Gonzalez nabs Branch Rickey Award". MLB.com. Retrieved August 13, 2012. ↑ "New Rickey award to Dave Winfield". The Afro-American. October 24, 1992. p. A7. Retrieved October 2, 2012. ↑ "Dave Winfield Statistics and History". Baseball-Reference.com. Retrieved October 1, 2012. ↑ "Kirby Puckett Statistics and History". Baseball-Reference.com. Retrieved October 1, 2012. ↑ "Ozzie Smith Statistics and History". Baseball-Reference.com. Retrieved October 1, 2012. ↑ "Tony Gwynn Statistics and History". Baseball-Reference.com. Retrieved October 1, 2012. ↑ "Brett Butler Statistics and History". Baseball-Reference.com. Retrieved October 1, 2012. ↑ "Craig Biggio Statistics and History". Baseball-Reference.com. Retrieved October 1, 2012. ↑ "Paul Molitor Statistics and History". Baseball-Reference.com. Retrieved October 1, 2012. ↑ "Al Leiter Statistics and History". Baseball-Reference.com. Retrieved October 1, 2012. ↑ "Todd Stottlemyre Statistics and History". Baseball-Reference.com. Retrieved October 1, 2012. ↑ "Curt Schilling Statistics and History". Baseball-Reference.com. Retrieved October 1, 2012. 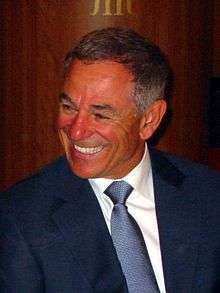 ↑ "Bobby Valentine Statistics and History". Baseball-Reference.com. Retrieved October 1, 2012. ↑ "Jamie Moyer Statistics and History". Baseball-Reference.com. Retrieved October 1, 2012. ↑ "Luis Gonzalez Statistics and History". Baseball-Reference.com. Retrieved October 1, 2012. ↑ "Tommy Lasorda to receive Branch Rickey Award" (Press release). Major League Baseball Advanced Media. May 16, 2006. Retrieved August 13, 2012. ↑ "Tom Lasorda Statistics and History". Baseball-Reference.com. Retrieved October 1, 2012. ↑ "John Smoltz Statistics and History". Baseball-Reference.com. Retrieved October 1, 2012. ↑ "Trevor Hoffman Statistics and History". Baseball-Reference.com. Retrieved October 1, 2012. ↑ "Torii Hunter Statistics and History". Baseball-Reference.com. Retrieved October 1, 2012. ↑ "Vernon Wells Statistics and History". Baseball-Reference.com. Retrieved October 1, 2012. ↑ "Shane Victorino Statistics and History". Baseball-Reference.com. Retrieved October 1, 2012. ↑ "R.A. Dickey Statistics and History". Baseball-Reference.com. Retrieved October 1, 2012. ↑ Harding, Thomas (2013-09-05). "Philanthropic Kershaw honored with Rickey Award". mlb.com. Retrieved September 5, 2013. ↑ "Rizzo youngest to win Branch Rickey Award". mlb.com. Retrieved September 18, 2014.